Volvo Car Corporation’s environmental work involves more than improving the environment for the surroundings and people outside the car. We also focus our development work on improving the environment for everyone travelling in the vehicle. Volvo cars have been developed according to the "clean inside and out" concept and are therefore equipped with a number of solutions that make them clean – inside and out. At a time when many people are suffering from asthma and allergies, it’s quite natural for Volvo Car Corporation to offer their customers a good environment inside their cars as well as outside. Achieving this means using the right materials and cleaning the air that enters the vehicle via the air-conditioning system. The interior of a Volvo is designed to be healthy and safe – even for people with contact allergies and for asthma sufferers. Extreme attention has been given to choosing environmentally-compatible materials. This means that they also fulfil the requirements of the Oeko-Tex 100 ecological standard – a major advance towards a healthier cabin environment. Oeko-tex 100 is an international environmental standard for textiles, which guarantees that the materials contain no harmful substances. Oeko-Tex certification covers seat belts, carpets, thread and fabrics. Even the leather upholstery undergoes chromium-free tanning with natural plant substances and meets the requirements. Other parts such as the handbrake button, load eyelet and steering wheel emblem have been tested for contact allergies and meet the requirements of the EU directive governing leakage of nickel from parts with long-term skin contact, for example jewellery. A Volvo is designed to make the air inside the car as clean as possible for the occupants. A cabin filter makes sure that dust, exhaust particles and pollen do not enter via the ventilation system. The customer can also choose to equip the car with an air quality system, in which an electronic sensor monitors the amount of air pollutants in the incoming air and closes the air inlet if the levels go too high. A combined filter with active carbon eliminates odour surges, for example from screenwasher liquid, petrol and diesel exhaust fumes and oil. The combination filter also makes sure that the occupants are exposed to significantly lower levels of nitrogen dioxide, ground-level ozone and hydrocarbons. So the air will be cleaner on the inside than outside, for example in environments with heavy traffic such as town centres, tunnels and holdups. Ground-level ozone is a gas that is harmful to health. It may cause breathing difficulties and harm to plants and animal life. Volvo Car Corporation was the first company in the sector to introduce the PremAir ® – a coating on the radiator which converts up to 75% of the ground-level ozone into oxygen as air passes though the radiator when the car is driven. PremAir ® is standard on most engines. The technology was developed by the American company Engelhard in collaboration with Volvo Car Corporation. Around 90% of the total environmental impact of a car happens when it is being driven. A Volvo meets strict international environmental requirements and has low fuel consumption to reduce the carbon dioxide emissions that contribute to the greenhouse effect. Volvo cars are competitive in terms of fuel consumption in their respective classes. Volvo’s highly modern direct-injection diesel engines provides a good fuel economy and carbon dioxide emissions about 20% lower than a petrol engine. Volvo’s bi-fuel engines run on natural gas/biogas or LPG (liquefied petroleum gas, butane or propane), with petrol as the reserve fuel. Gas operation gives very low emissions; in principle, driving on biogas make a zero net contribution to the greenhouse effect. Add to this the low running costs of gas and your environmental choice is rewarded in more than one way. Volvo’s engines can make your conscience that little bit clearer. Openness and objective information are important where environmental issues are concerned. Volvo Car Corporation has a unique way of doing this by means of its Environmental Product Declaration. Every Volvo car model has an eco-declaration. 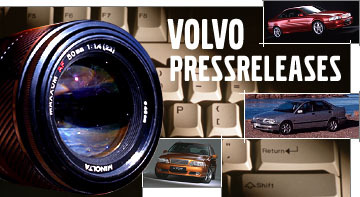 Volvo was the first car manufacturer in the world to provide this. Volvo Car Corporation’s Environmental Product Declaration is based on a holistic view, focused on the use of resources and on ecological consequences. This gives the car purchaser an integrated picture of the environmental impact of the car during its life, making it easier to do environmental comparisons between different Volvo models and engine options.